Eccentric millionaire Tommy Wiseau and his best friend, actor Greg Sestero, make a movie that becomes a cult classic. Though I’ve never heard of The Room, it’s a beloved midnight movie with a huge following. 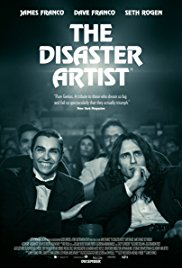 Based on the true story of making this movie, The Disaster Artist is unique, different and unexpected. Father Brad and Stepfather Dusty join forces when they end up spending the holidays together, along with their fathers and Dusty’s wife’s ex-husband. 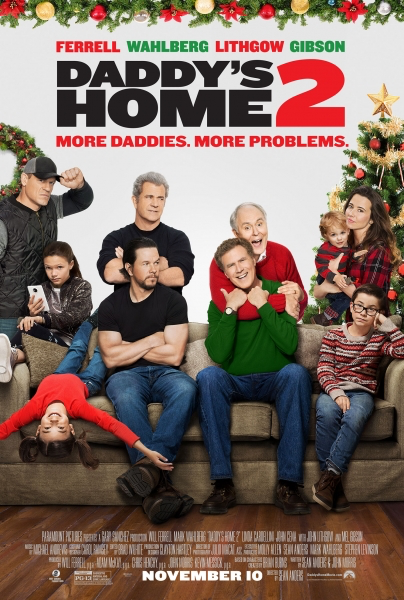 Daddy’s Home 2 is a movie that surprised me. I went in expecting to be mildly entertained and figured the best parts were already shown in the trailers, but I genuinely liked this movie. It was sweet and funny and touching. 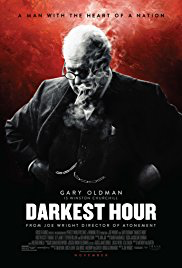 Darkest Hour opens with the call for Prime Minister Neville Chamberlain’s resignation and the installation of Winston Churchill. With the British Army stranded at Dunkirk, his unpopularity with King George and the machinations of scheming fellow Parliamentarians, Churchill must decide whether to negotiate with Germany or attempt to change the course of world history. When I went into this movie, I thought it was the life story of Winston Churchill. Instead, it’s a glimpse into his first 30 days as Prime Minister of the United Kingdom. The acting in this movie is superb, the story is compelling, and I think this film will deservedly earn some awards later this season.